Here's a list of our most frequently asked questions about the BUST Holiday Craftacular - Boston. Please read thoroughly before filling out our application! What is the BUST Holiday Craftacular - Boston? From knitwear and jewelry to home décor and specialty foods, the BUST Holiday Craftacular Boston is the one-stop-shop for the very best in handmade gifts and wares. Now in our 11th year, we are bringing 120+ crafters, vintage sellers, and food artisans together for two days of shopping, eating, and DIY-ing extravaganza in the heart of Boston’s South End neighborhood. When and where does the BUST Holiday Craftacular - Boston take place? The BUST Craftacular Boston will take place indoors at the historic Cyclorama at the Boston Center for the Arts at 539 Tremont Street, Boston, MA 02116. It will be open to the public on Saturday, December 17th, and Sunday, December 18th, 2016 from 11:00 AM to 6:00 PM. Monday, December 5, 2016 – Vendors who were not accepted/withdrawn will be refunded on this date. Apply here (but make sure you read this FAQ first!). Larger companies who wish to participate in the BUST Craftacular should consider getting involved through sponsorship. Corporate organizations such as CPG brands, financial services, apps, education brands or similar should contact Jules Abraham to build a partnership arrangement. This includes artists collectives, incubators or similar. Please note that brands who do not contact the BUST team may be subject to application rejection. The Jurying Comittee consists of BUST Magazine's Editor-in-Chief, Debbie Stoller, Creative Director, Laurie Henzel, and Events Manager, Jules Abraham as well as the seasonal events staff. If you have any questions about whether your products are a fit for BUST Craftacular | Holiday Boston, please email the Craftacular team (craftacular@bust.com). Yes. If you already know the person you'd like to share with, please indicate their name on the application form. If you would like to share a booth but don’t have a partner in mind, the BUST Craftacular team will match you up. All vendors must apply separately and provide all tax, vendor or other permits as required by local or state authorities; each vendor will be juried individually. We will attempt to accommodate shares as best as possible but this is not a guarantee. A full booth is a 6' x 6' space on the main floor of the Cyclorama; this includes a 6' x 30" table and two chairs within the booth space, as well as one wi-fi passcode and access to a standard electrical outlet. Booths are not curtained. Vendors are expected to bring their own extension cords, table top lighting (if desired), and a backup payment system. BUST will provide all tables and chairs, though you are welcome to bring racks or other display setups if you prefer. All displays must fit within this 6’ x 6’ space or a 6' x 12' space if you select a large booth. If you are interested in purchasing additional booth space, please contact craftacular@bust.com after submitting your application. If you are sharing a booth, you will split the provided space and table with a partner. Note, shared vendors must apply separately. Only two representatives per accepted application will be permitted. Zone 1 - The main floor of the cyclorama. Zone 2 - Front facing salons of the Cyclorama, featuring lots of natural light. These areas will recieve less traffic than the main floor and have been marked down accordingly. Green booths - Premium booths featuring the greatest visibility and traffic. Blue booths - Premium booths offering a corner space, but less visibility than green booths. This year, you will have the option to select Premium booth space for an additional fee. 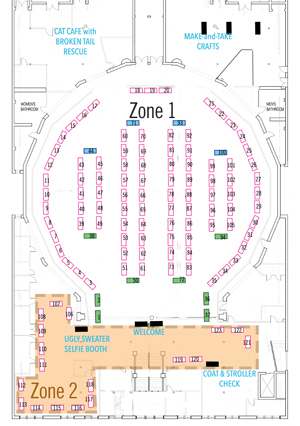 BUST considers any corner booth closest to the entrance side of the layout, any booth located in the first vendor row by the entrance, or any booth in a row whereby attendees must pass the booth in order to enter a new vendor row a Premium space. There is a limited number of Premium booths subject to the determination of the Fire Marshall. If you elect a premium booth space when you apply and BUST is unable to provide you with one due to space limitations, the fee paid for the premium booth option will be refunded to you before the show date. Alternatively, if you select a Premium booth space and wish to downgrade your space, you must do so before the refund dates listed in this FAQ. No refunds will be provided for downgrades beyond the December 3rd 50% refund date. Yes, but please bring your own extension cords. Your extension cords should be able to reach the end of your assigned vendor row. Yes—you will receive an access code for one device. Please note that though we will have tech staff on hand, wi-fi glitches can happen—especially with over 120 vendors using the network at the same time. Please come prepared with low-tech payment and display alternatives! Full refunds of booth price less the application fee ($20) will be available if we are notified before Thursday, November 17, 2016. Refunds of 50% of booth price are available if we are notified before Saturday, December 3, 2016. After December 3rd, we will not be able to refund your fee. All refunds will be issued less a $20 non-refundable jurying fee. This fee covers the administrative costs of jurying the hundreds of applications we receive for each BUST Craftacular. All Cancellations must be in writing. No refunds for cancellations due to inclement weather. Yes, you can leave your items and display setups at the venue overnight if you wish. Although the venue will be secure, we recommend that you take any cash or valuables with you. BUST Magazine and BCA Cyclorama are not responsible for any items you choose to leave overnight. Tax ID Numbers are required in Massachusetts. All exhibitors must be in compliance and in good standing with State & Federal Tax Laws and display Tax ID Certificate in booth. This is required for both in state and out of state vendors. Please contact craftacular@bust.com with any additional inquiries. A current license/permit to prepare, serve, or package food issued from the state of company origin. This document varies from state to state. If your products are bottled/packaged by another company, ask for their license/permit. How will the BUST Holiday Craftacular be promoted? For examples of BUST Craftacular coverage and vendor testimonials see here. PDFs, Word documents, .eps, .tif, and any other file that does not meet these size and format requirements will not be posted on BUST.com. BUST will try to make accomodations for vendors who do not submit web-ready materials as requested, however accommodations are at the team's descretion and it is each vendor's responsibility to provide the correct materials. Do shoppers need to purchase a ticket for the BUST Holiday Craftacular? Yes. Admission will be charged at the door. We welcome all volunteers wanting to help spread the word on the BUST Magazine Craftacular. Please email Jules Abraham, BUST Craftacular Event Manager, at craftacular@bust.com to get involved; also, check out the Promote Page to download web-ready promotional images. I'd like to promote my brand or product at the BUST Craftacular - Boston. How can I do that? We're always looking for like-minded companies to participate as sponsors in the BUST Craftacular. If you'd like information on sponsorship opportunities, please contact Jules Abraham (craftacular@bust.com) and Maggie Tam Clark (maggietamclark@bust.com). From time to time BUST will offer discount codes to vendors. Please be sure to copy the discount codes exactly, we cannot accommodate you if you are unable to use the correct discount code. Also note that codes expire at 12:01 midnight on the date mentioned. So for example, if the expiration is stated as 9/1 the code will be active throughout 8/31 up until 12:01 AM on 9/1. We cannot accommodate a discount if you miss the active window. Vendors are expected to act courteously and professionally towards attendees, BUST Staff, venue staff and other vendors. Vendors are also expected to comply with all laws as well as venue rules and regulations. Noncompliance may result in event ejection without refund. Come prepared to sell products for the entire duration of the event. Vendors who are no-shows, leave before the end of the event or are disruptive may not be allowed to participate in subsequent events. Vendors are expected to make their best effort to create a successful event and to work with Event Producers amicably to do so. The BUST staff is committed to producing a successful event for all involved. However, occasionally, events beyond our control may occur. This includes, but is not limited to, undesirable weather conditions, sunshine, 3rd party vendor failures, and much more. BUST is also not responsible for vendor's personal belongings, goods, sales, or vehicles. BUST will commit to delivering a venue for the sale of goods, table and advertising as described above. BUST also tries to provide reasonable accommodations to vendors in order to create a successful event, but is not always able to make such accommodations. Refunds will not be issued for unforeseeable events and BUST highly recommends vendors consider the risks involved in participating in a live event before committing funds.